STEEM price retreats. How now, brown cow? 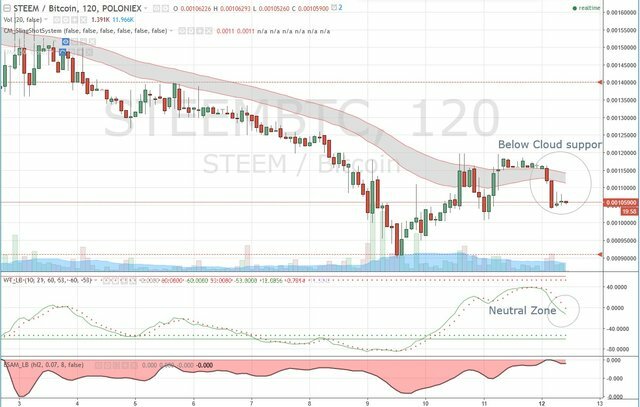 "Bottomline : STEEM/BTC may be stuck in a tight range-bound consolidation in the immediate term rather than heading higher or retracing back to a new low." "Near term supports are 0.00105 and/or 00103 levels. " 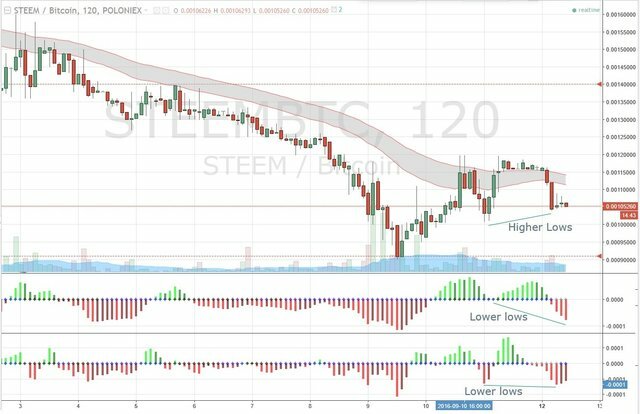 Well, STEEM/BTC in fact performed a retracement back to a low of 0.001041 and is now above 0.00105 mark (at least i got that support relatively correct). So my view on the tight range-bound consolidation did not occur but rather the potential price reversal did eventuate. What led to the pullback? Well, Bitcoin price suffered a significant correction falling from USD $631 down to $598 a few hours back triggering margin longs liquidation. Counter-intuitively however, most alt coins like STEEM and Ethereum also pulled back in fiat terms to greater extent than bitcoin. As such STEEM/BTC headed lower. A) Divergence: We currently have a "provisional" bullish divergence (higher lows in price, lower lows in indicators). Provisional because it depends on whether the current 0.00105 support can hold and not let STEEM/BTC set a lower low situation, reversing this bullish divergence. 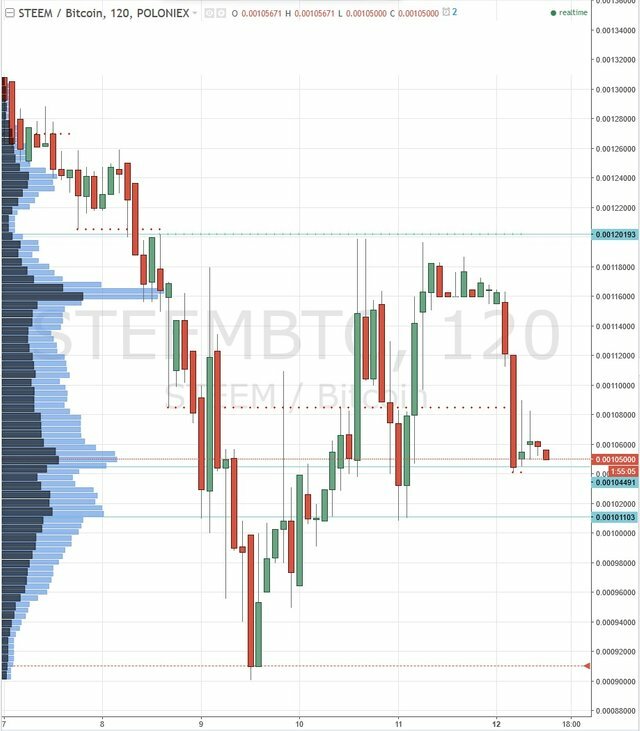 B) Probability: STEEM/BTC fell through the cloud support. It is also still in the middle of the neutral zone of overbought-oversold signals. Momentum wise, still in the red zone. As such the likelihood of a strong upward price reversal from the earlier bull divergence is not supported by these particular strength indicators for now. C) Near term support and resistance: we are currently sitting on the 0.00105 support level and this is being tested. If it breaks downwards to test the previous swing low, then the next major support is seen at 0.001010.